Engagio is an account-based marketing solution (ABM) that assists B2B companies to engage target accounts, expand customer relationships, and deepen sales-and-marketing alignment. 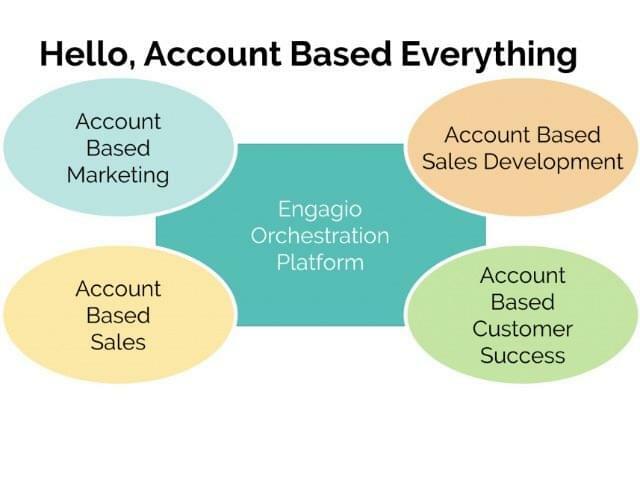 Engagio’s account-based platform complements existing marketing automation platforms with account-centric analytics and the ability to orchestrate outbound interactions across departments and channels. Engagio’s ABM Analytics enable users to know which marketing investments work best to reach target accounts and accelerate deals and provides insight into which accounts have the best engagement and opportunity for growth. It also allows users to measure the impact and ROI of their ABM programs. Engagio’s lead to account (L2A) matching finds and automatically attaches unconverted leads that should be included in target accounts, enabling users to tie activities to the right company, route them to the right owner, and get credit for the campaigns that touch them. Engagio Insights delivers account communication history and other insights in a convenient browser plug-in so users understand what will be relevant and resonant at target accounts, providing a single place to see every email, meeting, and interaction plus information to make communications more impactful. With Engagio PlayMaker users can orchestrate multi-step plays that span channels (email + phone + social + demand gen) and departments (marketing, sales development, sales, and customer success). Tasks and approvals make sure everyone stays coordinated and sales and marketing stay aligned. Engagio coordinates communications from everyone on the team to everyone at the target account. With Engagio, rather than sending generic messages, each email is personalized, reviewed, and sent by a human to drive more meaningful connections. Not sure Engagio is right for your business? Use our Marketing software Product Selection Tool to compare other Marketing software solutions. Have questions? Call or email one of our unbiased Technology Advisers for a free consultation. Learn everything you need to know about Engagio. Our experts will reach out to you shortly.